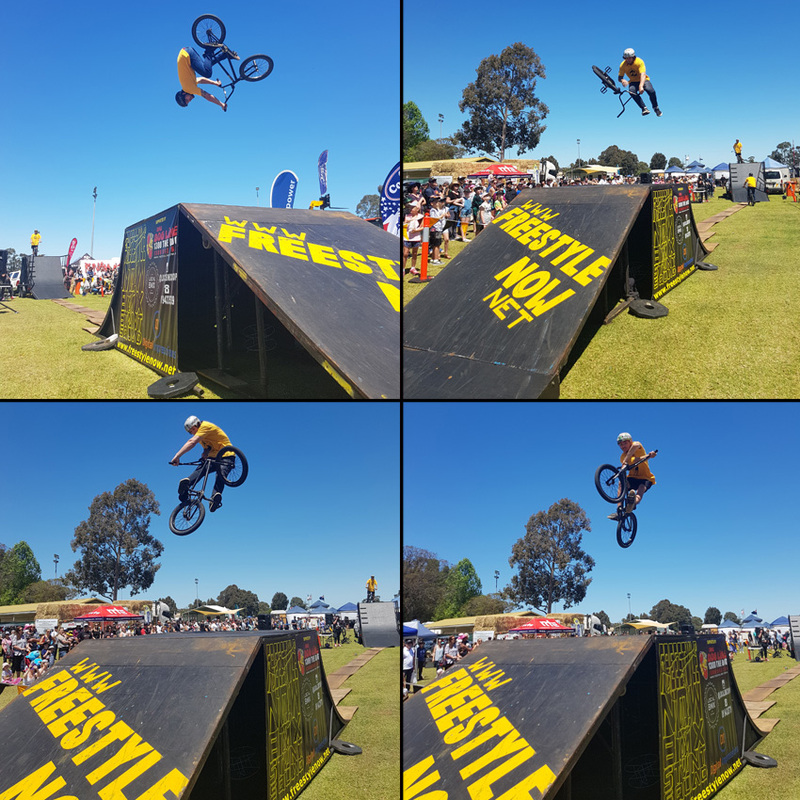 Freestyle Now recently performed some bmx stunt shows at the 2018 Brunswick Junction agricultural show. The Brunswick Junction agricultural show is one of the biggest one day show in Australia, the crowds were large. Freestyle now performed some amazing bmx stunt shows throughout the day, the audience were really getting into it and making lots of noise. The more noise the crowd make the more the riders get amped to perform bmx stunts. The crowds at were amazing, with every show having great numbers of spectators all coming to see the radical bmx stunt show that Freestyle Now was performing. Make sure you check out our coming events page to see where the next Freestyle Now bmx stunt shows will be going down. If you would like this type of great entertainment at your next event please get in contact with Freestyle Now with your requirements. A full list of all the stunt shows that Freestyle Now has ever done over the past 32 years can be found on our past stunt show page. Clockwise from top left – David Pinelli doing his signature move a dipped 360 spin in the air, its not a back flip but he almost goes upside down – Nathan Dobbie is a awesome bmx stunt rider and this bike flip is living proof of that awesomeness – Luke Tooze loves to do x ups and the crowds love them as well – Nathan Dobbie with a classic bmx trick the turndown, click in and locked.